Icebreakers for Christian teens help you make friends and get closer to people you already know. 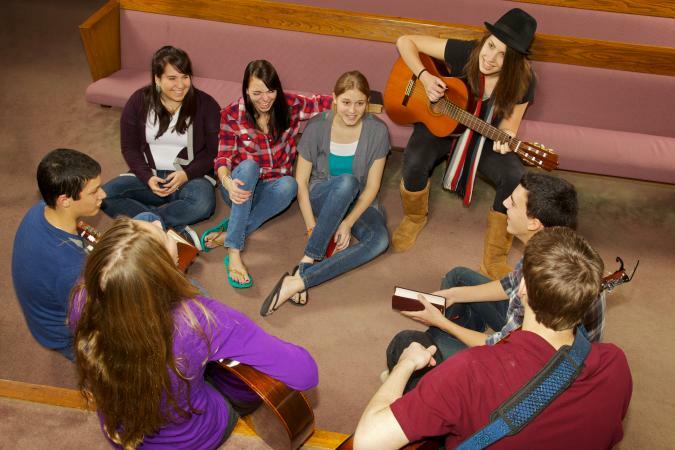 Teens with strong religious faith can use icebreaker games to share values and beliefs while having fun at a Christian school, church gathering, or youth group meeting. If you've been looking for youth group icebreakers for Christian teens to use at your next youth group meeting or elsewhere, there are several you can try. Some teens may not feel comfortable opening up on a personal level to a new group. In this activity, teens share things about themselves through Bible characters so it doesn't feel so intrusive. Give everyone a few minutes to think about which Bible character they are most like. Choose one person to share first. Keeping their Bible character in mind they give hints about what they have in common with the character. The rest of the group tries to guess who the character is. Give each teen a turn to share their Biblical bestie. The object of this icebreaker is to find one person in the room who has actually done each of the things on your Bingo card. Give each teen a blank Bingo card and have them write in common tasks or actions from the Bible such as "take an animal on a boat" or "picked an apple off a tree and ate it." When each person's bingo card is full, everyone mingles around the room for a set amount of time. At the end of time, see who found the most matches and discuss how different people matched with different actions. Add a simple religious twist to a standard game of charades by using Christian symbols as your things to act out. Spread slips of paper around the table and ask everyone to participate in writing common symbols of Christianity on each slip of paper. Talk about the symbols as you write including what they stand for and how the teens incorporate these symbols into their daily lives. When you have a bunch written down, put all the papers in a bowl and split into two teams. Play like standard charades where teams take turns acting out one of the symbols. The person who guesses correctly then has to share their thoughts on that particular symbol. Have everyone stand or sit in a circle and take turns sharing what they love most about the Christian faith. Have each teen write their answer down on a slip of paper. Put all the answers in a bowl and pull out one at a time. Each teen then makes a snap judgement about who in the group they believe wrote that answer down. Give the classic word game Hangman a Christian makeover and call it Holyman. A simple game like this helps everyone loosen up and learn each other's personality through fun. Instead of your stick figure drawing getting hanged, try to solve the puzzle before he ascends to heaven. Your finished Holyman can be a simple stick figure with wings and a halo. For each round, the answer should be the name of a Saint. Think the game Duck Duck Goose is just for small children? Think again! Play Duck Duck Goose with your group - but with a twist. Instead of running around the circle avoiding getting tagged, anyone selected as the "goose" must share a fun fact about their Christian values or how they adhere to those values in daily life to be allowed back in the group. Set up small areas where each person in the group spends a few minutes learning about the other person's Christian values. Switch every few minutes so that everyone gets a chance to chat with everyone. If you're worried that the group may be a bit shy, suggest questions that people can ask before starting the session. One of the more popular icebreakers out there is Two Truths and a Lie. In this version, each person goes around and states two true facts about something they've prayed for or about and one lie about something they've prayed for or about. The group has to decide what they think is the lie. In the end, the person comes clean, and the group can chat about the most surprising facts. For groups with members who know each other a little, a great icebreaker can be What's Christian About Me. Give each person a few cookies or candies so they have some of one color and some of a different color. When a teen chooses one color, they share something that's Christian about their personality, life, or actions. When they choose the other color, they share one thing that maybe doesn't align with traditional Christian values. For many Christians, faith is a strong part of everyday life. Go around the group and have everyone share one of the difficulties they encounter while trying to be a good Christian in everyday life. The group can help troubleshoot how to alleviate some of those issues. Use the Ten Commandments and some creativity in this easy word game. On index cards, write down each of the Ten Commandments. Give each member of the group a card. If your group is larger than ten, make duplicates. Give each person a chance to tell a short tale illustrating their Commandment. The group can try to figure out which Commandment the person is describing. If you have never been in a camp or organized group environment, you might not know exactly what an icebreaker is. Like the name suggests, an icebreaker is a short game or activity meant to "break the ice" amongst a group of people. Typically, you play icebreaker games or activities in group environments (such as at a Girls Scout camp or church event) to let people get to know one another in a non-obtrusive way. Some games involve physical activity while other games involve questions and answers. You can even come up with your own icebreakers to fit the situation. While icebreakers can seem a bit hokey to some people, they can also be a lot of fun. In addition to being a great way to get to know someone, icebreakers are also simple to plan for a group of people. Don't worry about how hard it can be to make friends as a Christian - just have fun.